The 4th great-grandfather of James Miner Bailey (1810-1899) is well documented as James Bailey of Rowley, MA who emigrated 1638 in the ship AMERICA. According to The Bailey Family by Jeanne Bailey Ransom ( pub 1991) James of Rowley was the son of Godfrey Bayley of Bradford Parish, Yorkshire. The origins of this family are unknown, but whether Scottish, English or Irish, the predominate shield of the Bailey family is the azure shield with nine stars (some variations in the shape of the stars) but the crest of the Scottish clan is a boars head. 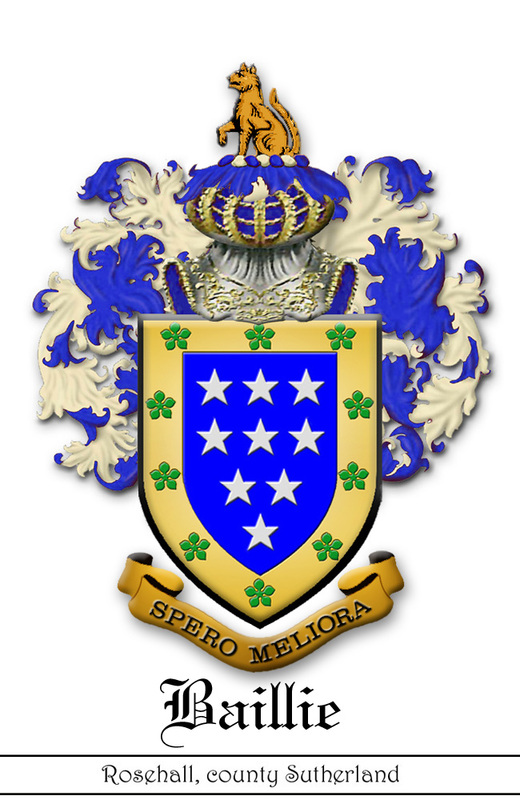 The Ringdufferin (Irish) arms seems the favorite within my family. 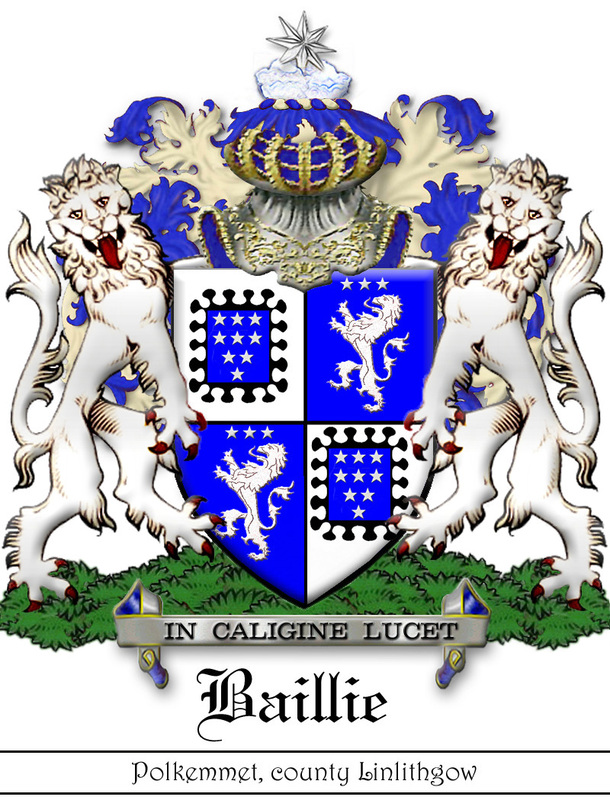 Note: (Scottish Baileys) Sir John Baillie of Hoprig in East Lothian signed an agreement at Berwick in 1292 with a seal bearing six mullets. 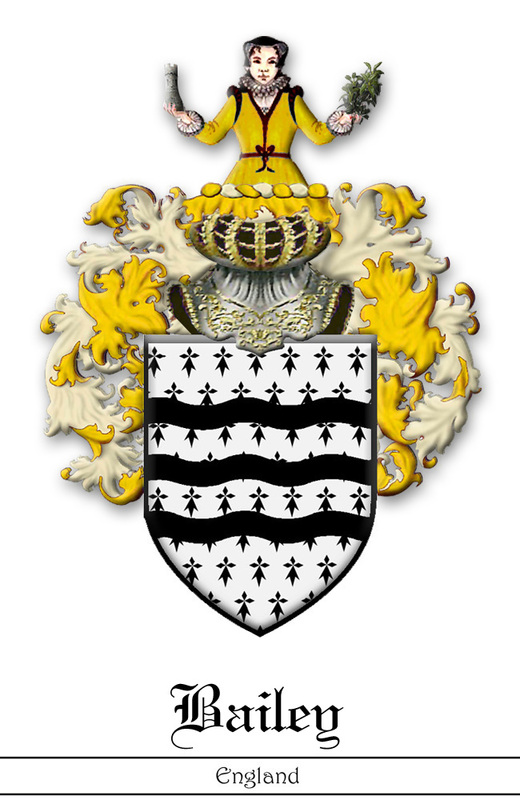 Either his heir or the subsequent heir would have been the William whose name is forever famously linked to Wallace, and is claimed as the ancestor of the several different Baillie lines ~ Lamington, Dunain, Innisbargie, Dochfour, Parbroth, Carphin, et al. Per pale azure and sable, a cross crosslet saltirewise between four estoiles OR. Shield divided in two (per pale) of blue and black with four six-pointed stars whose rays are wavy around a gold cross made from four Latin Crosses (arranged at right-angles to each other crossing diagonally). 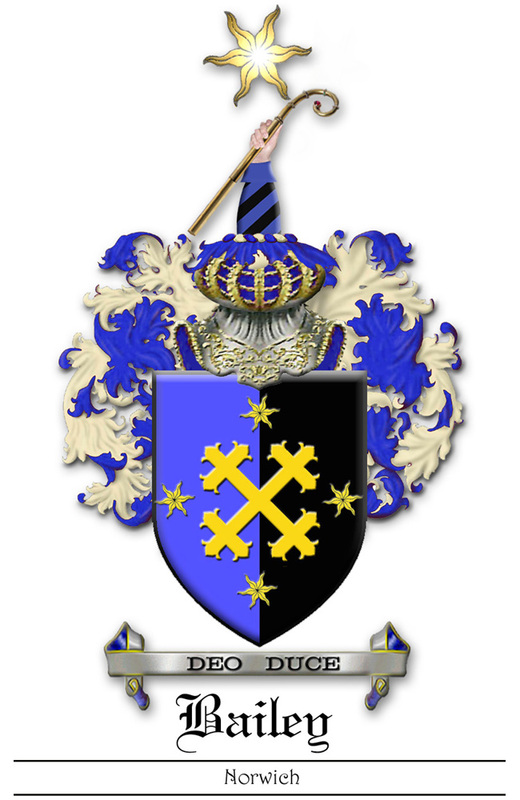 A cubit arm erect vested bendy of six azure and sable cuff argent the hand proper holding a crosier and surmounted by an estoile both OR. 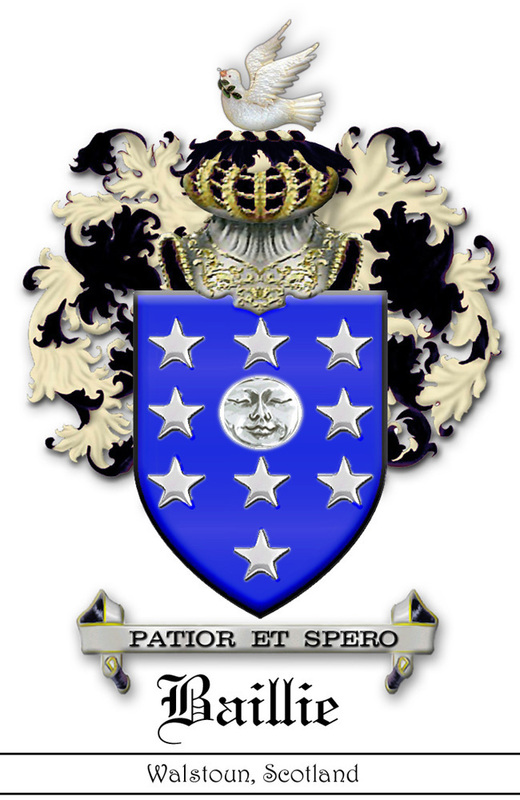 An arm cut off at the elbow that is clothed in diagonal stripes of blue and black with a blue cuff and a natural colored hand holding a gold like a shepherd's crook topped by a gold six-pointed star whose rays are wavy. Erminois a lion passant sable holding in the dexter paw a cross pattée fitchée gules on a chief nebulée of the second a cross pattee, OR. Shield of heraldic fur consisting of black ermine spots on a golden field with a black lion with one foot in the air (as if walking to the viewer's left) holding in its left paw a red cross which has arms narrow at the center, and broader at the perimeter and has the under limb brought to a point. On a black partition of the field running across the top (divided by a line made up of a series of bulbous protrusions) a gold cross cross which has arms narrow at the centre, and broader at the perimeter. 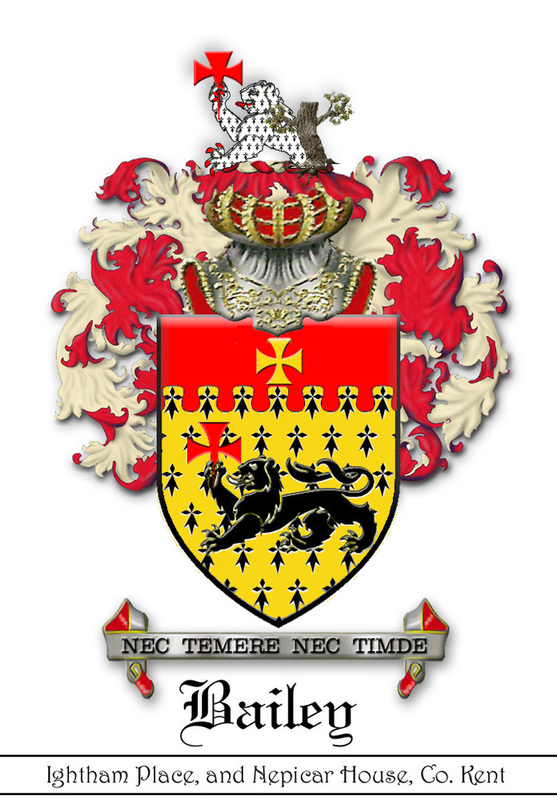 In front of a demi lion erminois holding in the dexter paw a cross pattée fitchée gules the trunk of a tree eradicated fesswise and sprouting proper. A horizontal trunk of a naturally colored leaf sprouting tree with the. Behind the tree: the upper half of a lion (of heraldic fur consisting of black ermine spots on a golden field) holding in in its left paw a red cross which has arms narrow at the center, and broader at the perimeter and has the under limb brought to a point. Shield of white or silver, powdered with black spots representational of the tail of an ermine. Over the shield 3 black wavy narrow horizontal stripe across the middle. A demi lady holding on her dexter hand a tower, in her sinister a laurel branch vert. The upper half of a lady holding in her left hand a tower(a tapering cylinder of masonry topped with battlements, usually having a door and a few windows) and in her right hand a green laurel branch. Argent between two bars, three annulets in fesse gules all between as many martlets of the last. Shield of silver. Over the shield 2 red narrow horizontal stripe across the middle. Between the two bars 3 red rings. Above and below the two bard 3 red stylized birds of the swallow family. A griffin sejant argent semée of annulets gules. Covered with small red rings of indefinite number a silver griffin (a beast that is amalgamation of lion and eagle) on its haunches, with both forepaws on the ground. 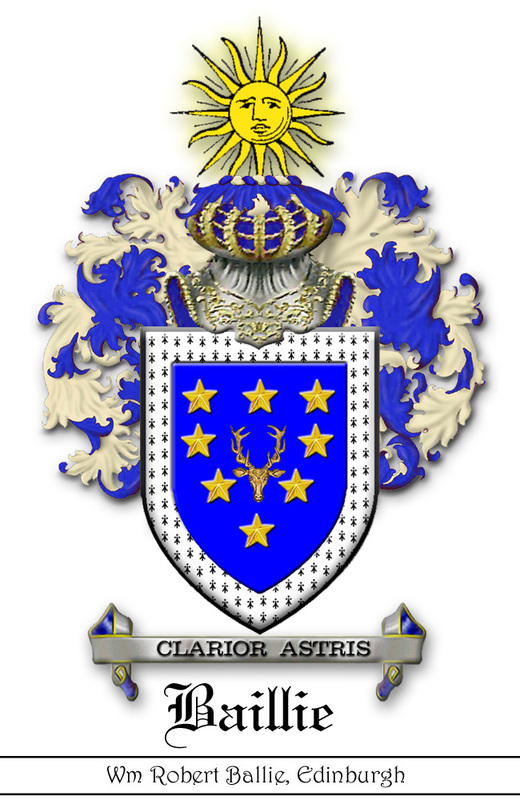 Shield of blue with nine silver (argent) stars – three on top, two stars in the middle, one star on the bottom. A human hand holding a short sword. 1st and 4th, azure nine estoiles three, three, two and one, for Baillie; 2nd and 3rd, argent a chev, gules. betw. three cross-crosslets fitchee sable, within a double tressure flory counterflory of the second for Kennedy. 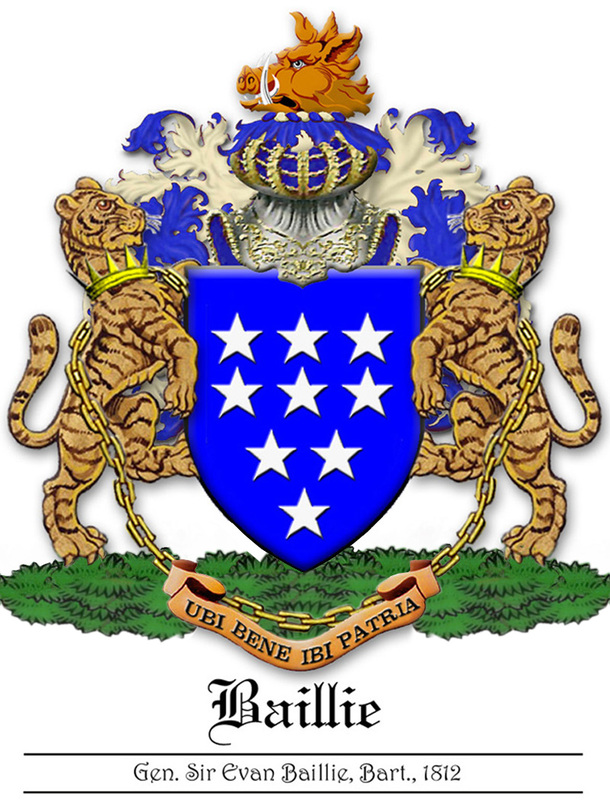 The top left and bottom right parts (for Baillie) are blue with nine silver (argent) six-pointed stars whose rays are wavy – three on top, two stars in the middle, one star on the bottom. 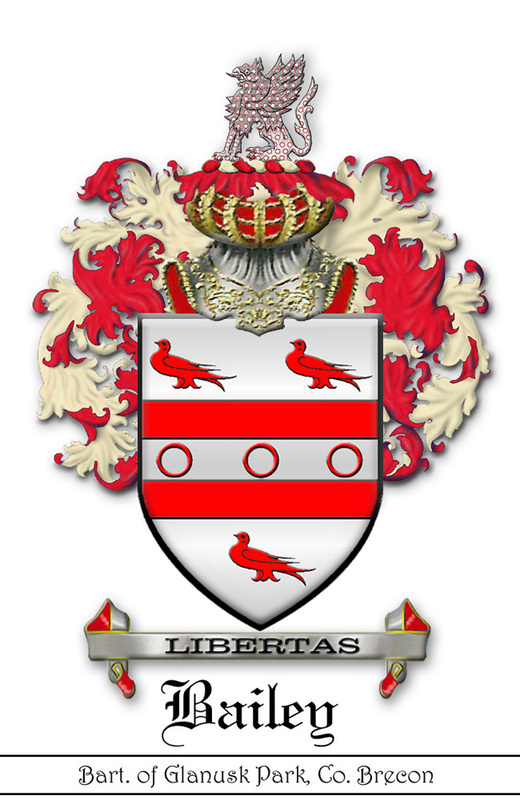 The top right and bottom left parts (for Kennedy) are silver with two red narrow bands consisting occupying the inward half of where a bordure would be, following the exact outline of the shield. The bands are decorated with fleurs-de-lis set in alternating directions and within the bands are three black crosses that have the three upper ends crossed (so as to from three small crosses) and the lower bar of the cross is sharpened at the lower end. Between the three crosses a red a bent stripe that runs from side to side, rising to a sharp corner in the middle. On the left (for Baillie) a silver boar’s head; the end severed with a straight cut. On the right (for Kennedy) a blue dolphin swimming to the viewer's left. 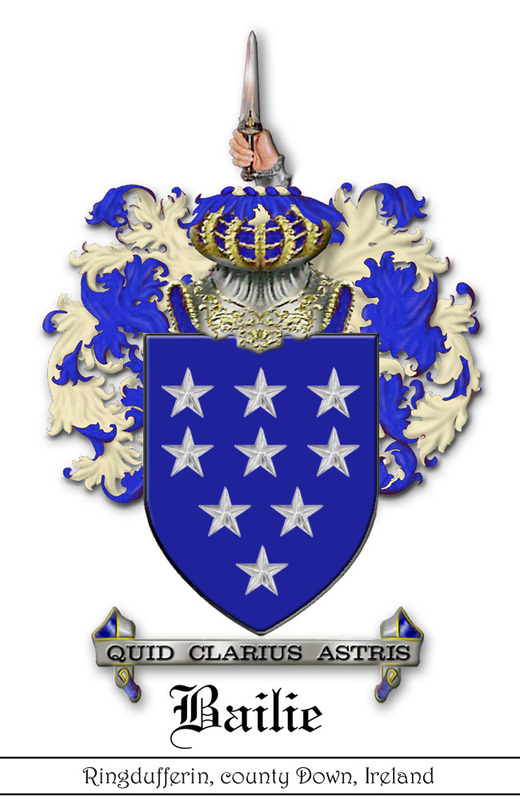 Azure (in some early blazons, sable) nine stars three, three, two, and one, argent. 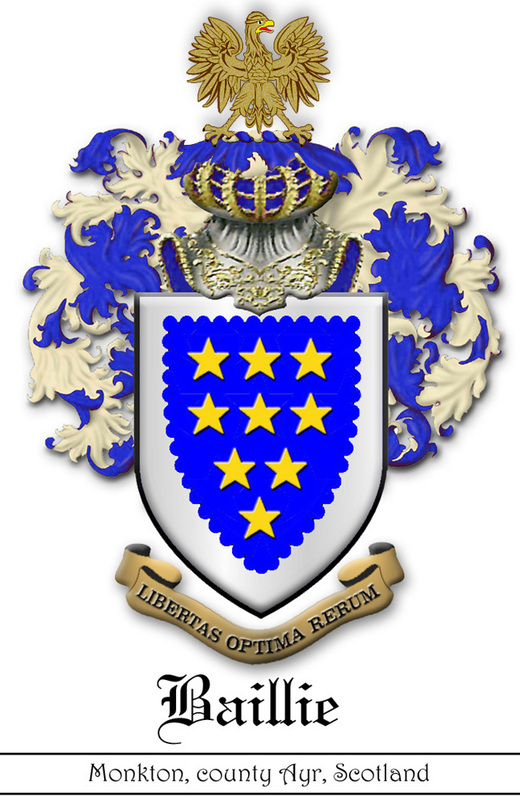 Shield of blue (in some early blazons a shield of black) with nine silver (argent) stars – three on top, two stars in the middle, one star on the bottom. A boar's head erased proper. Shield of black with nine silver (argent) stars – three on top, two stars in the middle, one star on the bottom. Between the stars a round disc representing the sun surrounded by numerous rays, usually wavy. A gold symbol resembling the half moon with the points turned up. Azure, the moon in her complement betw. nine stars, three two three, and one, argent. Shield of blue with the full moon, represented with human features in the disk. Surrounding the moon nine silver (argent) stars – three on top, two stars in the middle, one star on the bottom. A dove volant holding in her beak a branch of olive proper. A dove flying toward the viewer's left holding in her beak a natural colored olive branch. 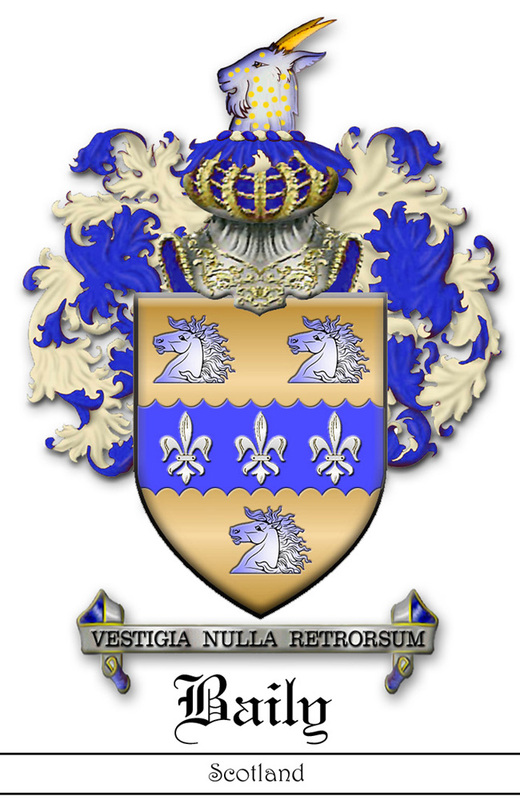 As Jervieswoode, a crescent argent for difference. 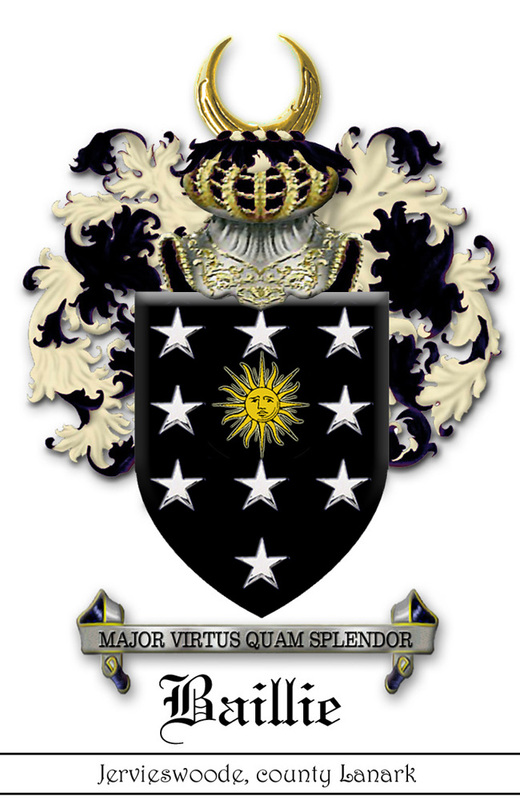 The same as Jervieswoode: Shield of black with nine silver (argent) stars – three on top, two stars in the middle, one star on the bottom. Between the stars a round disc representing the sun surrounded by numerous rays, usually wavy. For difference to Jerfieswoode: a silver crescent. Sable the sun in his splendour betw. 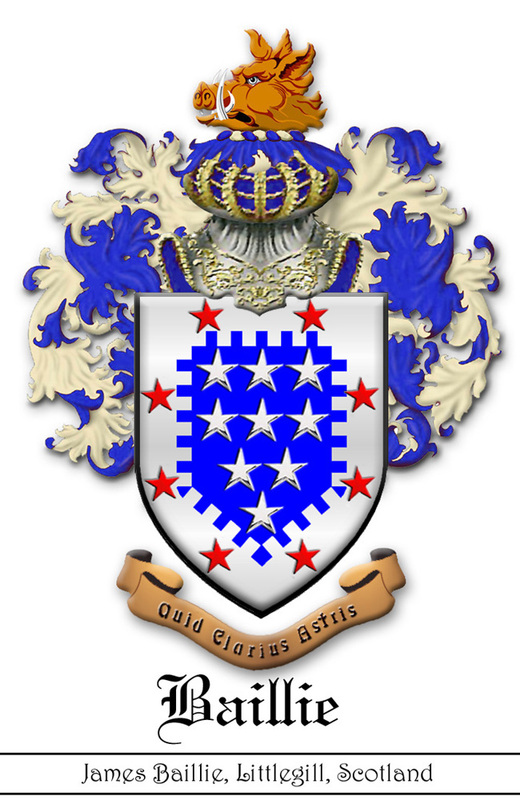 five stars two two and one, argent in middle chief an eagle's head erased OR. 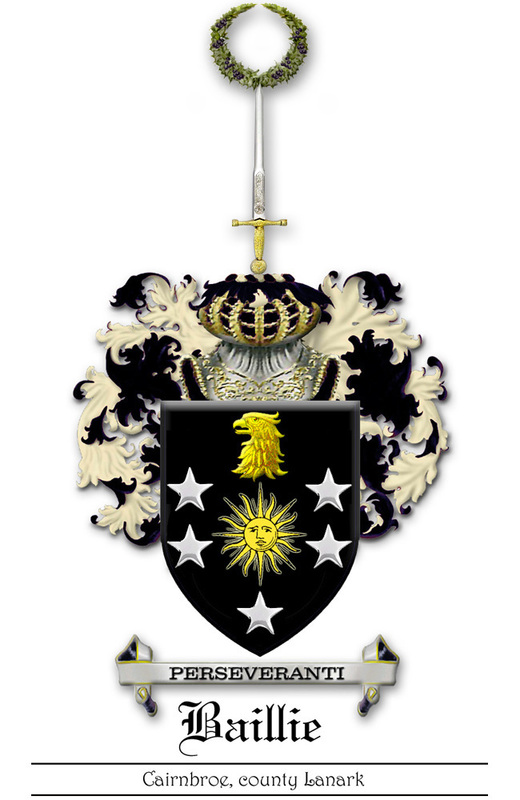 Shield of black with five silver (argent) stars – two on top, two in the middle, one on the bottom. Between the stars a round disc representing the sun surrounded by numerous rays, usually wavy. On the point of a sword erected proper hilted and pommeled OR, a laurel wreath fructuated of the first. An erect naturally colored sword with the grip and cross-piece of a sword and the ball at the end of a sword hilt in gold. At the point of the sword a naturally colored laurel wreath. 2nd and 3rd, azure a lion rampant and in chief three stars argent, Inglis of Murdistown. The top left and bottom right parts (for Baillie) are bordered in silver with internal lines drawn with a series of bulbous protrusions, which are supposed to resemble clouds Within the border is a field of blue nine silver (argent) six-pointed stars whose rays are wavy – three on top, two stars in the middle, one star on the bottom. The top right and bottom left parts (for Inglis of Murdistown) blue with 3 silver stars above a silver lion on one hind foot and prepared to battle. Naturally colored eight pointed star rising out of a cloud. Two silver lions holding the shield up or standing beside it as if to keep or guard. Azure nine stars, three, three, two and one, argent a bordure wavy OR. A star of eight points issuing out of a cloud proper. A star of eight points issuing out of a naturally colored cloud. 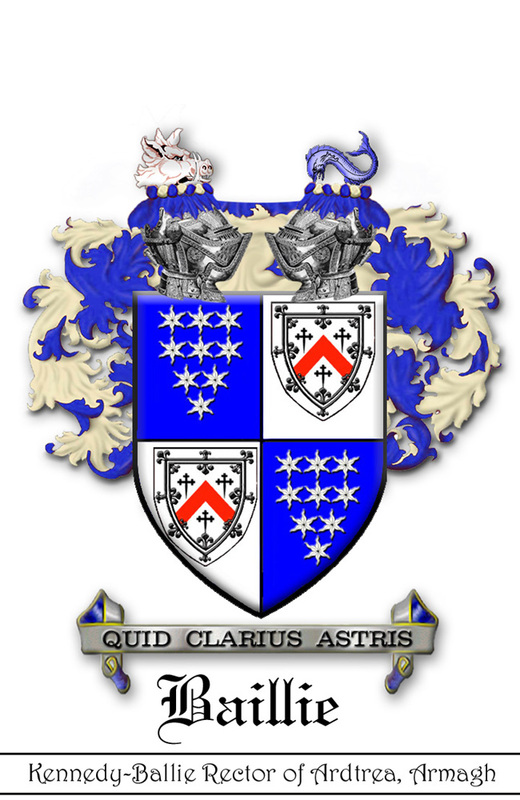 Azure nine stars, three, three, two and one, argent a bordure OR charged with ten cinquefoils vert. A naturally colored cat seated, facing the viewer's left. A naturally colored boar’s head severed with a jagged cut. Two tigers proper. Each gorged with an antique crown or, and thereto affixed a chain passing betw. the forelegs and reflexed over the back of the last. Two naturally colored tigers. Each with a gold crown (with s encircled by a series of plain triangular rays) encircled round the neck or throat. Each crown is attached with a gold chain that passes between the front forelegs and is bent round over the back the through the front forelegs. Shield of blue with a silver border drawn with circular bites taken from it. Within the border nine gold (OR) stars – three on top, two stars in the middle, one star on the bottom. An eagle reguardant his wings raised proper. Anaturally colored eagle facing forward with wings raised and head turned back to the viewers right (looking back over its shoulder). 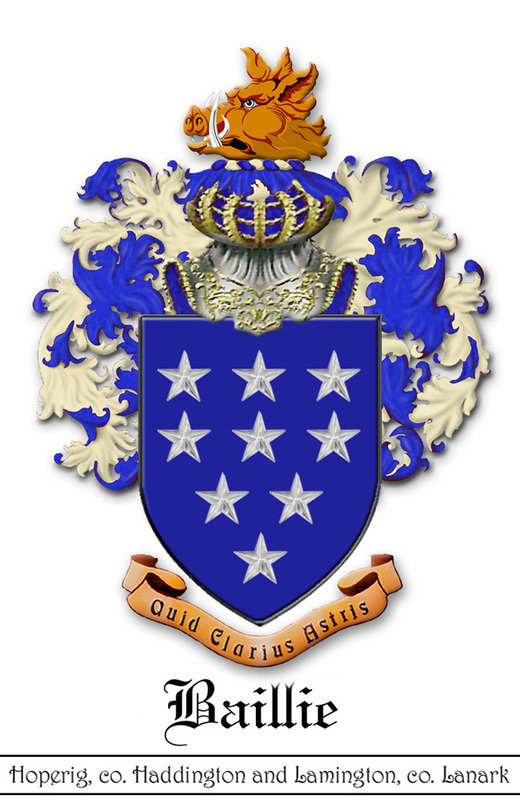 Azure nine stars of six points wavy, three, three, two and one, OR, a bordure of the last charged with two boars' heads erased in pale and two hands holding daggers erect in fess all proper. Shield of blue with a gold border. Vertically aligned on the border two naturally colored boar’s head severed with a jagged cut. Horizontally aligned on the border two naturally colored hands holding short swords. Within the border nine gold (OR) six-pointed stars with wavy points – three on top, two stars in the middle, one star on the bottom. A boar's head couped proper. A naturally colored boar’s head; the end severed with a straight cut. 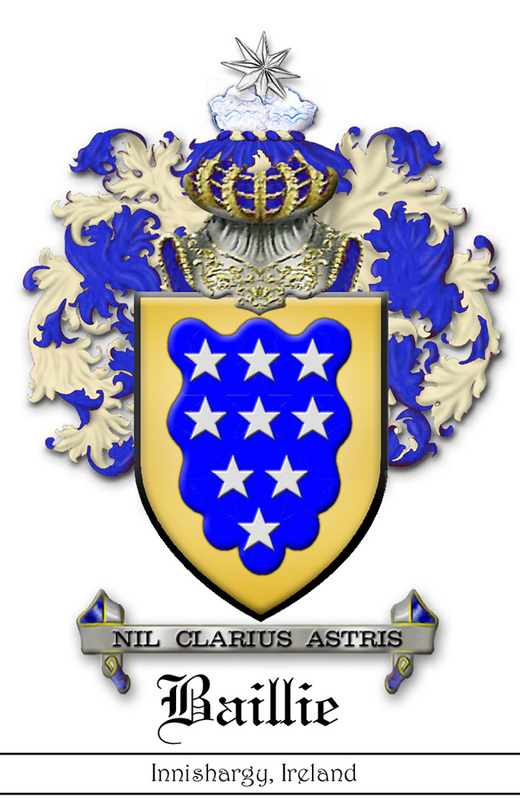 Azure nine stars OR three, three, two and one, a bordure argent charged with eight crescents of the first. A naturally colored 6 pointed star. Azure nine stars three, three, two and one argent, a bordure indented of the second charged with eight stars gules. Azure eight stars three, two, two and one OR, in fess point a stag's head cabossed of the last, a border erm. Shield of blue with an ermine (heraldic fur white with of black ermine) border. Within the border nine gold (OR) stars – three on top, two stars in the middle, one star on the bottom. In the center of the shield a gold stag’s head head affronte and cut off so as to show no part of the neck. The sun in his splendour proper. A yellow disc with twelve or more wavy rays. Shield of gold with three horse’s heads severed with a jagged cut. 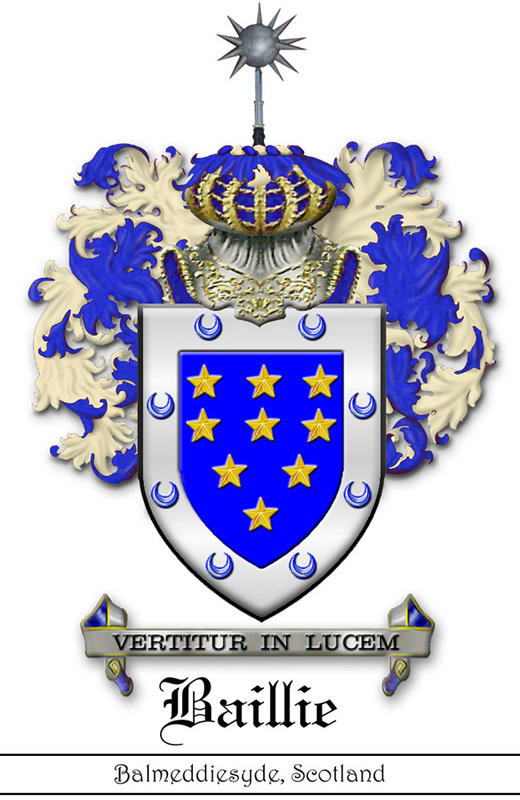 A blue horizontal band across a shield drawn with circular bites taken from it with 3 silver fleurs-de-lis. A goat's head erased azure bezantee horned OR. A blue goat’s head severed with a jagged cut indiscriminately strewed over with gold discs. 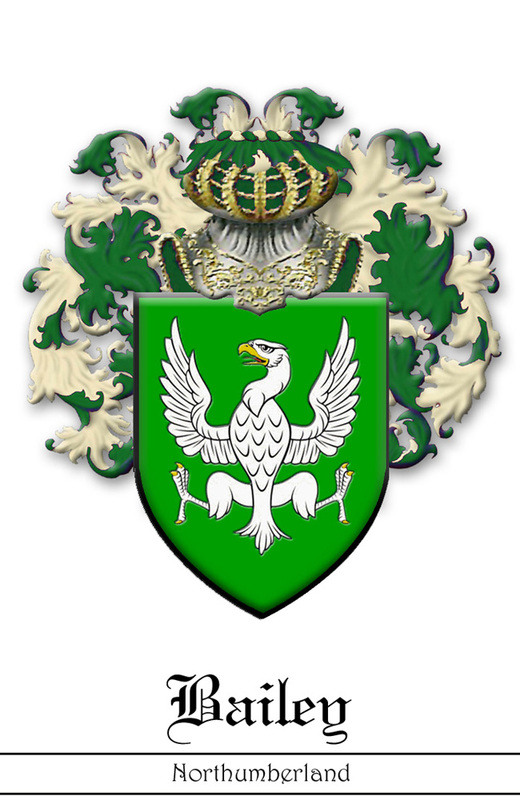 Vert an eagle displayed argent, armed OR. Shield of green with a gold eagle with both wings, the body and the legs displayed and with red, claws, beak and tongue.